the Modvel Lower Back Cushion provides the needed succor and support to your lower back, relieving you of back pain. What’s more, our back cushion is perfect for a soothing recovery from back surgery. Made from memory foam, the Back Cushion is energy absorbing, and feels so soft on the lower back. While you spend so much time sitting, you are bound to develop a bad posture. With the Modvel Lower Back Cushion, any tailbone pain associated with a sedentary life will disappear, while your posture will also improve. With a smart and orthopedic design, the Foam Cushion is firm enough to support your back, and keeps the shape of your spine. The Lower Back Cushion has a very soft cover, made from Velboa and Mesh. It is breathable, and won’t irritate your skin or make you sweaty. the fabric will come out as soft as ever! Now you can sit comfortably and pain-free anywhere with our portable lightweight foam. Weighing just a little over one pound, you can carry it around wherever you go! It also has straps which you can wrap around the back of your chair at a height that is comfortable for your back. Ditch The Pain! Add The Lower Back Cushion To Your Cart NOW! ✔ NO MORE BACK PAIN: Does your job have you restrained in a chair? Do you have to go through a long flight? Do you have to drive somewhere far? Then you definitely need the Back Cushion! This Pillow will support your lower back and reduce your back pain. It will also provide you with comfort and it will keep your posture. The soft yet firm Foam Cushion has been ergonomically designed to keep your spine in its natural S shape. ✔ COMFORT EVERYWHERE: Take the Back Cushion with you wherever you go and always sit comfortably in every seat and chair. Use it on any chair at home or put it on your office chair. Put it on your seat of your car while you are driving or during long trips and you will be thankful for it during airplane flights! You can even use it to lie on the floor and it is perfect for people who use wheelchairs. 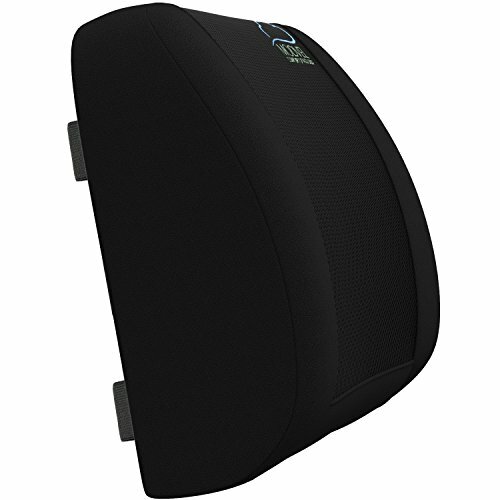 ✔ THE BEST QUALITY: There is not a better Back Cushion on the market and here is why. Our Back Pillow has memory foam filling, a soft, firm material that hugs you back and supports you at the same time. As for the cover, it is made with Velboa fabric, so that it will be soft on your skin. The Foam Cushion is breathable and allows airflow to pass through so that your back will not get sweaty while using it. ✔ ADJUST IT TO YOUR CHAIR: The Lower Back Cushion has a strap with a strong buckle. You can use the strap to attach and adjust to your chair. So if you don't want the cushion to be as low as the seat, simply strap it to the back of the seat and adjust to your preferred height. ✔ ENJOY A 100% RISK FREE PURCHASE: Keeping you satisfied and providing you with the friendliest customer service is our number one goal. This is why we stand 100% behind our products, offering you a full money back guarantee and assuring an entirely risk-free purchase for you!